The internet supports a global ecosystem of social interaction. Modern life revolves around the network, with its status updates, news feeds, comment chains, political advocacy, omnipresent reviews, rankings and ratings. For its first few decades, this connected world was idealized as an unfettered civic forum: a space where disparate views, ideas and conversations could constructively converge. Its creators were inspired by the optimism underlying Stuart Brand’s WELL in 1985, Tim Berners-Lee’s World Wide Web and Electronic Frontier Foundation co-founder John Perry Barlow’s 1996 “Declaration of Independence of Cyberspace.” They expected the internet to create a level playing field for information sharing and communal activity among individuals, businesses, other organizations and government actors. One of the biggest challenges will be finding an appropriate balance between protecting anonymity and enforcing consequences for the abusive behavior that has been allowed to characterize online discussions for far too long. Respected internet pundit John Naughton asked in The Guardian, “Has the internet become a failed state?” and mostly answered in the affirmative. The U.S. Senate heard testimony on the increasingly effective use of social media for the advancement of extremist causes, and there was growing attention to how social media are becoming weaponized by terrorists, creating newly effective kinds of propaganda. Scholars provided evidence showing that social bots were implemented in acts aimed at disrupting the 2016 U.S. presidential election. And news organizations documented how foreign trolls bombarded U.S. social media with fake news. A December 2016 Pew Research Center study found that about two-in-three U.S. adults (64%) say fabricated news stories cause a great deal of confusion about the basic facts of current issues and events. A May 2016 Pew Research Center report showed that 62% of Americans get their news from social media. Farhad Manjoo of The New York Times argued that the “internet is loosening our grip on the truth.” And his colleague Thomas B. Edsall curated a lengthy list of scholarly articles after the election that painted a picture of how the internet was jeopardizing democracy. 2016 was the first year that an internet meme made its way into the Anti-Defamation League’s database of hate symbols. Celebrity social media mobbing intensified. One example: “Ghostbusters” actor and Saturday Night Live cast member Leslie Jones was publicly harassed on Twitter and had her personal website hacked. An industry report revealed how former Facebook workers suppressed conservative news content. The Center on the Future of War started the Weaponized Narrative Initiative. Many experts documented the ways in which “fake news” and online harassment might be more than social media “byproducts” because they help to drive revenue. #Pizzagate, a case study, revealed how disparate sets of rumors can combine to shape public discourse and, at times, potentially lead to dangerous behavior. Google (with its Perspective API), Twitter and Facebook are experimenting with new ways to filter out or label negative or misleading discourse. Researchers are exploring why people troll. And a drumbeat of stories out of Europe covered how governments are attempting to curb fake news and hate speech but struggling to reconcile their concerns with sweeping free speech rules that apply in America. Participants were also asked to explain their answers in a written elaboration and asked to consider the following prompts: 1) How do you expect social media and digital commentary will evolve in the coming decade? 2) Do you think we will see a widespread demand for technological systems or solutions that encourage more inclusive online interactions? 3) What do you think will happen to free speech? And 4) What might be the consequences for anonymity and privacy? While respondents expressed a range of opinions from deep concern to disappointment to resignation to optimism, most agreed that people – at their best and their worst – are empowered by networked communication technologies. Some said the flame wars and strategic manipulation of the zeitgeist might just be getting started if technological and human solutions are not put in place to bolster diverse civil discourse. A number of respondents predicted online reputation systems and much better security and moderation solutions will become near ubiquitous in the future, making it increasingly difficult for “bad actors” to act out disruptively. Some expressed concerns that such systems – especially those that remove the ability to participate anonymously online – will result in an altered power dynamic between government/state-level actors, the elites and “regular” citizens. Anonymity, a key affordance of the early internet, is an element that many in this canvassing attributed to enabling bad behavior and facilitating “uncivil discourse” in shared online spaces. The purging of user anonymity is seen as possibly leading to a more inclusive online environment and also setting the stage for governments and dominant institutions to even more freely employ surveillance tools to monitor citizens, suppress free speech and shape social debate. Most experts predicted that the builders of open social spaces on global communications networks will find it difficult to support positive change in “cleaning up” the real-time exchange of information and sharing of diverse ideologies over the next decade, as millions more people around the world become connected for the first time and among the billions already online are many who compete in an arms race of sorts to hack and subvert corrective systems. The majority in this canvassing were sympathetic to those abused or misled in the current online environment while expressing concerns that the most likely solutions will allow governments and big businesses to employ surveillance systems that monitor citizens, suppress free speech and shape discourse via algorithms, allowing those who write the algorithms to sculpt civil debate. One other point of context for this non-representative sample of a particular population: While the question we posed was not necessarily aimed at getting people’s views about the role of political material in online social spaces, it inevitably drew commentary along those lines because this survey was fielded in the midst of a bitter, intense election in the United States where one of the candidates, in particular, was a provocative user of Twitter. Most participants in this canvassing wrote detailed elaborations explaining their positions. Their well-considered comments provide insights about hopeful and concerning trends. They were allowed to respond anonymously, and many chose to do so. These findings do not represent all points of view possible, but they do reveal a wide range of striking observations. 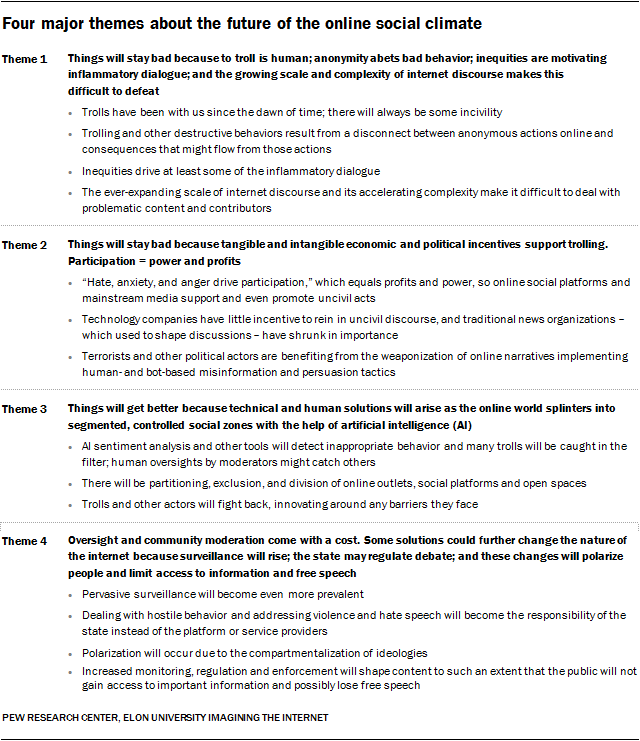 Respondents collectively articulated four “key themes” that are introduced and briefly explained below and then expanded upon in more-detailed sections. The individual’s voice has a much higher perceived value than it has in the past. As a result, there are more people who will complain online in an attempt to get attention, sympathy, or retribution. An anonymous respondent commented, “The tone of discourse online is dictated by fundamental human psychology and will not easily be changed.” This statement reflects the attitude of expert internet technologists, researchers and pundits, most of whom agree that it is the people using the network, not the network, that is the root of the problem. Trolls now know that their methods are effective and carry only minimal chance of social stigma and essentially no other punishment. Some leading participants in this canvassing said the tone of discourse will worsen in the next decade due to inequities and prejudice, noting wealth disparity, the hollowing out of the middle class, and homophily (the tendency of people to bond with those similar to themselves and thus also at times to shun those seen as “the other”). Unfortunately, I see the present prevalence of trolling as an expression of a broader societal trend across many developed nations, towards belligerent factionalism in public debate, with particular attacks directed at women as well as ethnic, religious, and sexual minorities. As billions more people are connected online and technologies such as AI chatbots, the Internet of Things, and virtual and augmented reality continue to mature, complexity is always on the rise. Some respondents said well-intentioned attempts to raise the level of discourse are less likely to succeed in a rapidly changing and widening information environment. As more people get internet access – and especially smartphones, which allow people to connect 24/7 – there will be increased opportunities for bad behavior. Several of the expert respondents said because algorithmic solutions tend “to reward that which keeps us agitated,” it is especially damaging that the pre-internet news organizations that once employed fairly objective and well-trained (if not well-paid) armies of arbiters as democratic shapers of the defining climate of social and political discourse have fallen out of favor, replaced by creators of clickbait headlines read and shared by short-attention-span social sharers. The weaponization of social media and “capture” of online belief systems, also known as “narratives,” emerged from obscurity in 2016 due to the perceived impact of social media uses by terror organizations and political factions. Accusations of Russian influence via social media on the U.S. presidential election brought to public view the ways in which strategists of all stripes are endeavoring to influence people through the sharing of often false or misleading stories, photos and videos. “Fake news” moved to the forefront of ongoing discussions about the displacement of traditional media by social platforms. Earlier, in the summer of 2016, participants in this canvassing submitted concerns about misinformation in online discourse creating distorted views. Most respondents said it is likely that the coming decade will see a widespread move to more-secure services, applications, and platforms and more robust user-identification policies. Some said people born into the social media age will adapt. Some predict that more online systems will require clear identification of participants. This means that the online social forums could splinter into various formats, some of which are highly protected and monitored and others which could retain the free-for-all character of today’s platforms. Some experts in this canvassing say progress is already being made on some fronts toward better technological and human solutions. The future Web will give people much better ways to control the information that they receive, which will ultimately make problems like trolling manageable. Technology will mediate who and what we see online more and more, so that we are drawn more toward communities with similar interests than those who are dissimilar. Facebook, Twitter, Instagram, Google and other platform providers already “shape” and thus limit what the public views via the implementation of algorithms. As people have become disenchanted with uncivil discourse “open” platforms they stop using them or close their accounts, sometimes moving to smaller online communities of people with similar needs or ideologies. Some experts expect that these trends will continue and even more partitions, divisions and exclusions may emerge as measures are taken to clean things up. For instance, it is expected that the capabilities of AI-based bots dispatched to assist with information sorting, security, and regulation of the tone and content of discourse will continue to be refined. The expert comments in response to this canvassing were recorded in the summer of 2016; by early 2017, after many events (Brexit, the U.S. election, others mentioned earlier in this report) surfaced concerns about civil discourse, misinformation and impacts on democracy, an acceleration of activity tied to solutions emerged. Facebook, Twitter and Google announced some new efforts toward technological approaches; many conversations about creating new methods of support for public affairs journalism began to be undertaken; and consumer bubble-busting tools including “Outside Your Bubble” and “Escape Your Bubble” were introduced. Some participants in this canvassing said they expect the already-existing continuous arms race dynamic will expand, as some people create and apply new measures to ride herd over online discourse while others constantly endeavor to thwart them. 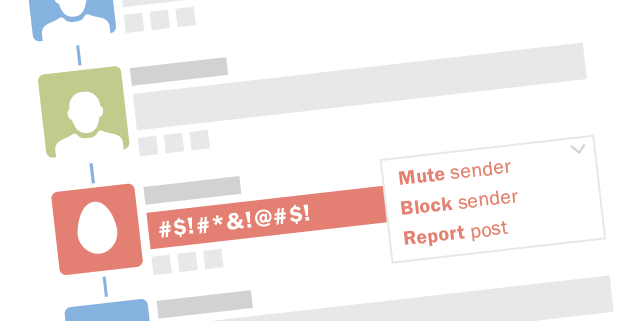 A share of respondents said greater regulation of speech and technological solutions to curb harassment and trolling will result in more surveillance, censorship and cloistered communities. They worry this will change people’s sharing behaviors online, limit exposure to diverse ideas and challenge freedom. While several respondents indicated that there is no longer a chance of anonymity online, many say privacy and choice are still options, and they should be protected. Terrorism and harassment by trolls will be presented as the excuses, but the effect will be dangerous for democracy. A number of respondents said they expect governments or other authorities will begin implementing regulation or other reforms to address these issues, most indicating that the competitive instincts of platform providers do not work in favor of the implementation of appropriate remedies without some incentive. My fear is that because of the virtually unlimited opportunities for negative use of social media globally we will experience a rising worldwide demand for restrictive regulation. Experts predict increased oversight and surveillance, left unchecked, could lead to dominant institutions and actors using their power to suppress alternative news sources, censor ideas, track individuals, and selectively block network access. This, in turn, could mean publics might never know what they are missing out on, since information will be filtered, removed, or concealed. The fairness and freedom of the internet’s early days are gone. Now it’s run by big data, Big Brother, and big profits. This section features responses by several more of the many top analysts who participated in this canvassing. Following this wide-ranging set of comments on the topic will be a much-more expansive set of quotations directly tied to the set of four themes. Was the idea of ‘reasoned discourse’ ever reasonable? 1) Nowness is the ultimate arbiter: The value of our discourse (everything we see or hear) will be weighted by how immediate or instantly seen and communicated the information is. Real-time search, geolocation, just-in-time updates, Twitter, etc., are making of now, the present moment, an all-subsuming reality that tends to bypass anything that isn’t hyper-current. 2) Faceless selfism rocks: With photos and video, we can present ourselves dimensionally, but due to the lack of ‘facework’ in the online sim, our faces are absent or frozen in a framed portrait found elsewhere, and so there is no face-to-face, no dynamic interactivity, no responsive reading to our commentary, except in a follow-up comment. Still, we will get better at using public discourse as self-promotion. “3) Anonymity changes us: Identity-shielding leads to a different set of ‘manners’ or mannerisms that stem from our sense (not accurate, of course) that online we are anonymous. 4) Context AWOL: Our present ‘filter failure,’ to borrow Clay Shirky’s phrase, is almost complete lack of context, reality check, or perspective. In the next decade we will start building better contextual frameworks for information. 5) Volume formula: The volume of content, from all quarters – anyone with a keypad, a device – makes it difficult to manage responses, or even to filter for relevance but tends to favor emotional button-pushing in order to be noticed. “6) Ersatz us: Online identities will be more made-up, more fictional, but also more malleable than typical ‘facework’ or other human interactions. We can pretend, for a while, to be an ersatz version of ourselves.